Chain stores make all cities the same. Let's face it, once you've visited one H&M, you've pretty much visited them all. Whilst there may be a few differences in their presentation, the majority of the experience will be the same. There's nothing wrong with that, in fact there's a lot to admire from a strong brand that can provide consistency across the globe but sometimes you want something a little different. Independent stores might not be able to offer the selection that a chain can, or sell products at the same discount as Amazon but there's something special about browsing through the carefully curated choices in unique settings. I love experiencing the personality of smaller brands coming through the product, decor and music choices they've made. Whenever we travel, Jen and I always make a list of the independent stores that we want to visit. Planning our day trip to Leeds this weekend was no different. Our first stop was in the grand Corn Exchange. Back in the early 1900's the building was a bustling centre for the exchange and sale of corn wheat, barley, hops, peas, beans, seeds, oil cake and flour and hosted a farmers market and regular leather fair. In more recent years, it has been transformed into a host for independent retail enterprises including designer-makers, specialist retailers and foodie outlets. All Blues Co. is a clothing retailer specialising in casual classics, heritage brands and Americana. 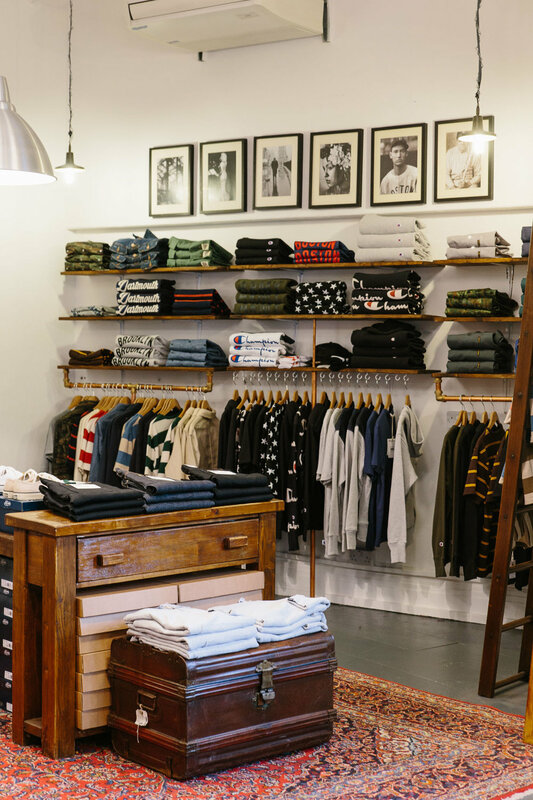 Founded just this year, they already have some strong labels adorning their shelves, including Levis, Lee, Champion, Laboureur, Sperry and Red Wing Shoes. Even though their store has only been open 6 weeks, it has a well established feel that is cohesive and considered. We spoke to one of the brand's founders, Mano about the store and he was able to tell us about the products and why they had been chosen for All Blues Co. Yet another reason why independent stores trump big chains. You can find All Blues Co. at The Corn Exchange and on Facebook. Village is a small bookshop and gallery filled with selection of contemporary art, design, fashion and photography books, magazines and prints. Located in the stunning Thorntons Arcade amongst other well established independent stores, Village's bright window display provides an immediate indication that the collection within has been carefully curated. A print on the far side of the store states, "This is not a library" which is apt, as it'd be far too easy to get drawn into an article of a magazine you only intended to flick through. Be sure to check out the zines and pin badges during your visit too.